Article was done by Victor Shakineza with Thierry Kita’s consent and input. With the current climate of xenophobia in South Africa and intolerance around the world, it was refreshing to witness something special during the 2008 NBA playoffs. One early morning I was watching a Celtics game during the playoffs and I thought I heard something along the lines of “UBUNTU” but being in deep Africa, I told myself that maybe I needed to get my ears checked… Why would an NBA team be using an African term during the grueling playoffs? Then during the Boston Celtics vs. Atlanta Hawks series I heard the Celtic shout a word that sounded like “BUNTU” and this time I knew there was more to this story. A few days before the penultimate game of the LA Lakers vs. Celtics series, I got some email correspondence with a bit of history behind the “UBUNTU” routine that the Celtics had adopted. I quickly realized that the person to speak to was Thierry Kita. 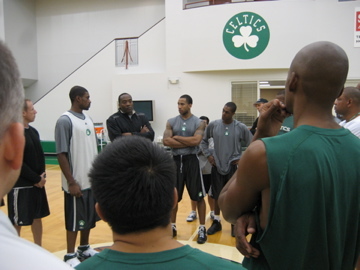 So how does Thierry Kita fit into the Boston Celtics picture? Thierry Kita has been involved with the Celtics for the past 4 seasons. This year, Doc Rivers (The Celtics coach) had just finished reading the Desmond Tutu book when he gave Thierry a call asking him for his opinion in using “UBUNTU” as the team motivator for the season. 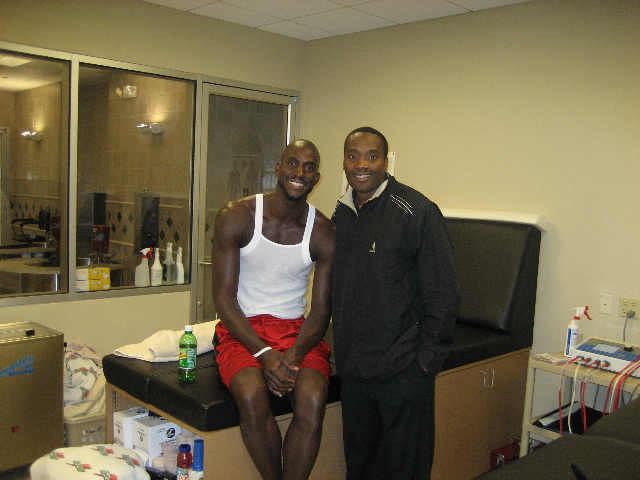 Thierry thought it was a good idea and without hesitation Doc asked him to start preparing for the teaching of “UBUNTU” and they would use it at their preseason camps, in Europe and Waltham Massachusetts. Having lived in South Africa for the past 19 years, teaching the “UBUNTU” principles was part and parcel of Thierry Kita life considering this was also part of the life skills lessons taught at his work with Hoops 4 Hope. 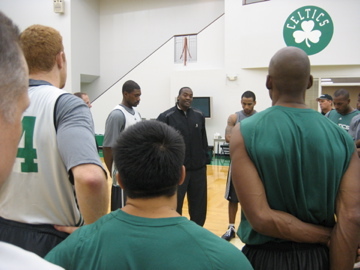 Thinking the job was half done, he now had to factor in the influence of the new recruits to the Boston Celtics franchise, namely Kevin Garnett and Ray Allen. 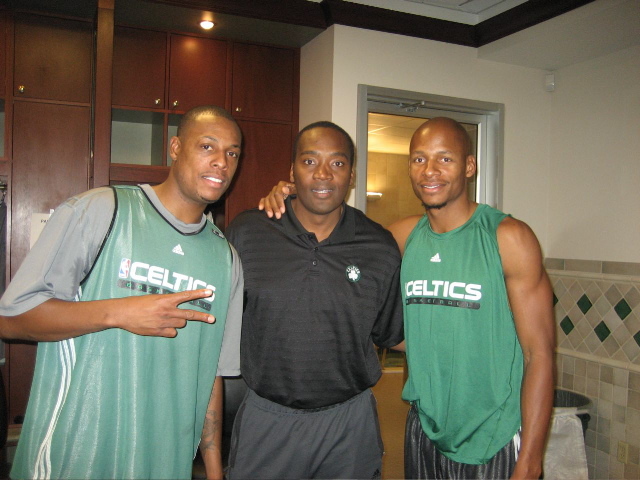 With the birth of Boston’s very own “Big Three”, there was plenty of media attention wherever the team went and the excitement was mounting around this new look Celtics. These new developments made Thierry Kita a bit nervous at the beginning but after spending a lot of time around the players, the teaching went smoothly and the players quickly bought into it. 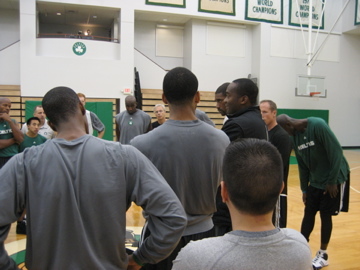 Doc Rivers made the process easier by having a few of the rookie players read and present “UBUNTU” to the team. It was incredible to hear the team shouting: 1, 2, 3 UBUNTU during their time-outs. Last but not least Thierry Kita has been credited with motivating the team during game 7 in Atlanta and during the pivotal game 4 in Los Angeles where a lot of the UBUNTU teachings were applied. On a personal note: Most basketball players in South Africa have nothing to look forward to after high school and usually end up being lost to other careers, substance abuse, crime, etc… but this article goes to prove that South Africa has all the tools at its disposal to succeed; but the key is how we use them. The potential of this nation is endless but it’s meaningless if you don’t nurture it in the right way. All pictures were supplied by Thierry Kita. This bears testiment that we have the best foundation to start rebuilding our fallen basketball. All players in SA at one point or another has been involved with Teirry Keita and have learnt from him and actually seen how passionate he is about the game. whether it be his coaching or his general life advice. He is proof that if you love something YOU have to push to realize that the love manifest into something that will benefit others who love the game as much as you do. The mans passion and pure hustle ability is astounding and he is one of the few coaches which we had in SA who had a lot to offer but had to leave because the situation in SA basketball was not conducive to good basketball practise, Sam Vincent, Mike Scholl,Zoba and the likes. All these coaches had great plans for our basketball but were let down by mismanagement. All I can say is that we are responsible for basketball and we must HUSTLE to get it back in order, even if it means stepping on people toes to make sure that they do the right thing. We should all take a leaf out of Thierry Keita’s book and practice UBUNTU in all spheres of life. i sure agree with you guys (Cabby and Neo). the destiny of the game is based on how much we willing to fight for the sport we all love. talking about Terry, i was also taken back in game 2 of the NBA finals i think when PP was taken off the field. Doc said something to his players about the south african coach. i had to rewind that a couple of times. yep,he was motivating them from a phrase that Terry told the team. we had a good ambassodor for ourselves in Terry but the issue is, are we willing to work hand in glove with him. There are a lot more people like Thierry, Cabby, Neo, etc… out there and like I said in my personal note, basketball needs to start using these skills at its disposal. Everytime someone with knowlege leaves the game, its the wrong people that seem to stay and multiply. Let’s learn from past mistakes and give the next generation something to look forward to. Since I am a man of action :-), I have emailed Kita to see if we can ride on this amazing achievement. You are right baller, we can learn a lot from this teachings. my plea as i indicated before is for all former and current bball players to come together and develop the game in their communities. we need to revive leagues in the townships. we know its going to take us atleast 3 years but then at the end we will reap the rewards like wheel chair basketball is doing now. Great post Vic! Fantastic to see the real impact such a basic principle has – one not practiced often enough at home. However…. just look at these comments above. I’m excited at the prospect a bright future for basketball in SA, and we have tools at our disposal to make it work, so let’s do this guys! Cabby, looking forward to hearing about your plans. If the Ubuntu principle could be applied in Mzansi’s Basketball – the game would probably reach great heights. Angola are champions because they love this game and have its interest at heart, which is lacking in Mzansi. So if little Ubuntu could be practised by the future BSA officialdom the game could probably go far. So if a little Ubuntu could be practised by the future BSA officialdom the game could probably go far. Oh, and it seems Bill Russell won’t have to share one of his championship rings with Kevin Garnett after all, as he promised he would if KG failed to win one [read here. Thierry, seems Bill owes you one 😉 Well done! 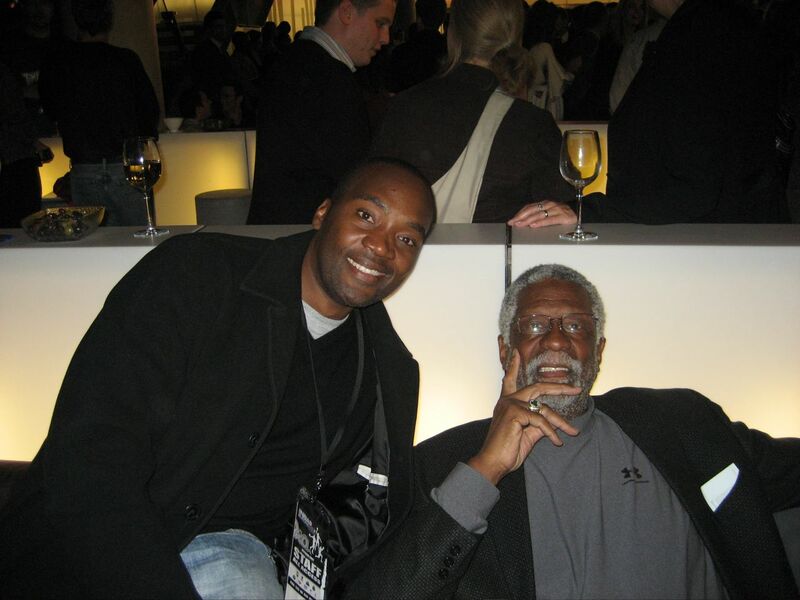 Let me just say, great bball players, Jordan…. and of course Victor, Neo in SA are true illustration of that word. one would achieve greater things only if he/she do what he/she does for him/herself and others around whether they are known or not…. http://www.candor4pbl.blogspot.com in order to open dialogue on the comeback of the Premier Basketball League. The situation of basketball is more unfortunate than we may think. It is true that the sport has lost many athletes to other careers. Those people are hunting for resources they hoped basketball would give them.